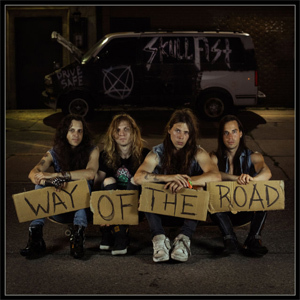 The Canadian heavy metal heroes SKULL FIST are set to unleash their third album, Way Of The Road on October 26th, 2018 through NoiseArt Records. Today, the band released the cover artwork of that new album and presents the first digital single "You Belong To Me". The official video of that track can be seen on KNAC.COM HERE. "This is the first record without all of the graphic art, It just felt right to do something a little more real this time around. The sound is more natural, I wanted the cover to be more natural as well. Raw, nothing to hide behind. The songs and lyrics can probably give you an idea on why we choose to present it all like this. We released "You belong to me" first since it's got more of a staple Skull Fist sound. If you've ever stood in a room and been told the walls are red even though you hear that voice of reason sayings its blue then you'll get this track. There's a lot of different extremes in songwriting on this record and I don't think any one song is standout on this thing. I think if you've got the time and are interested in how we see things then just listen to the whole record from start to finish. Do people still sit and listen to albums at this point?" Pre-order Way Of The Road and the first single digital HERE. A strong moral compass in battle with even stronger drinks. When SKULL FIST set off their first riffs and deliver their third studio album full of authenticity, honesty and shady lyrics, it feels like drowning in a sea of confusing heavy metal morality. The quartet from Toronto, Canada are locked in a life long struggle with a twist on nostalgic heavy metal and a persistent desire for spiritual glory and personal peace. Relight the fire that was started with the debut record and take another step further with every note and word of the new nine song album Way Of The Road. Stay tuned for more SKULL FIST news.